Sneijder trainin wi the Netherlands in 2012. 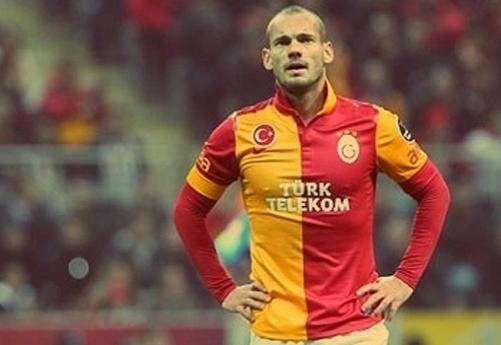 Wesley Sneijder (Dutch pronunciation: [ˈʋɛs.li ˈsnɛi̯.dər] ( listen); born 9 Juin 1984) is a Dutch fitbawer that plays for Qatar Stars League club Al-Gharafa an the Netherlands naitional team. He wis named UEFA midfielder o the saison an ane o the three best midfielders in the warld for 2010 bi FIFA. A product o the AFC Ajax Academy, he previously played for Ajax, wi whom he wan seven trophies an wis awairdit the Johan Cruijff Award in 2004. He wis sauld tae Real Madrid for €27 million in 2007, winnin La Liga in his first saison wi the club an later bein sauld tae Internazionale for €15 million. At Inter, he wan Serie A, the UEFA Champions League, the FIFA Club Warld Cup, an twa Coppa Italia. Efter bein sauld tae Galatasaray for €7.5 million in 2013, he helped the club win the Süper Lig in his first saison, follaein wi the capture o the Turkis Super Cup, efter a 1–0 win against rivals Fenerbahçe. ↑ "FIFA World Cup South Africa 2010 – List of Players" (PDF). Fédération Internationale de Football Association (FIFA). p. 20. Retrieved 8 June 2013. ↑ "The story of Wesley Sneijder". Official website. Wesley Sneijder. Retrieved 13 November 2009.